Russia’s biggest floating dry docks might remain on the bottom of the Kola Bay. 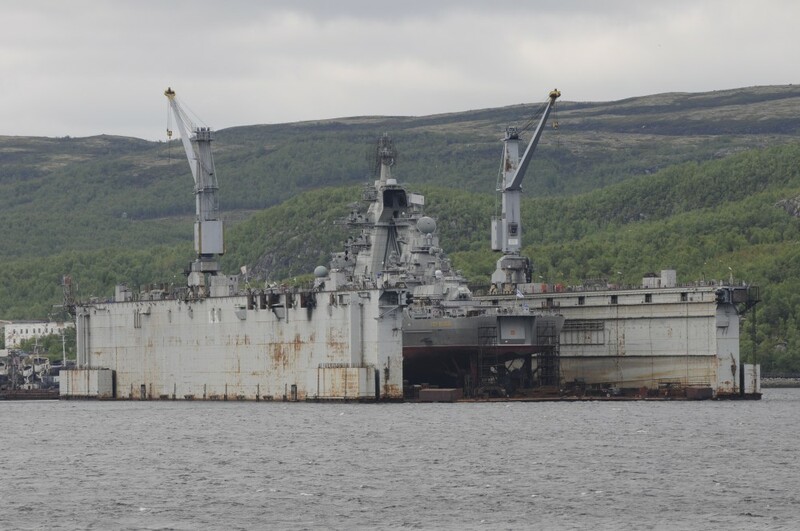 The 80,000 ton big floating dry dock that on Tuesday night sunk in the waters outside Shipyard No 82 in Roslyakovo near Murmansk might not be lifted, leader of the United Shipbuilding Corporation hints in an interview. «It is not yet clear whether the floating dock at the 82nd shipyard, on which aircraft carrier «Admiral Kuznetsov» stood, will be raised», Aleksey Rakhmanov told Interfax. «To lift the dock, which has a loading capacity of 80,000 ton, is in itself an operation that will cost no small money,» he underlines. He also does not exclude that the installation is significantly damaged. «To say exactly whether it is possible to lift this dock can be done only after divers have studied the condition of the equipment,» he makes clear. The floating dock sunk as the aircraft carrier was taken off the installation and onto the water. The accident was reportedly triggered by a power outage. It is unclear whether the Russian Northern Fleet will be able to follow up its modernization plan after the loss of the dry dock. No other regional installations of the kind are able to handle repair works of Russia’s biggest naval vessels, including the «Admiral Kuznetsov», battle cruiser «Pyotr Veliky» and the biggest strategic submarines. Both the «Admiral Kuznetsov» and the «Pyotr Veliky» are up for comprehensive upgrades that will require the use of dry docks. The upgrade of the «Admiral Kuznetsov» include both navigation equipment and weaponry. All the ship’s electro-mechanical components, including the main propulsion system, will be repaired. Several of the engine-boilers will be replaces and the runway will be upgraded. Also, the cruise-missiles system will be replaced from Granit missiles to the Caliber missiles. According to the original plan, the ship was to be ready for operations in year 2021. The modernization of “Pyotr Velikiy” could start that same year, as soon as her sister vessel “Admiral Nakhimov” is ready to sail. “Admiral Nakhimov” is currently under modernization at the Sevmash yard in Severodvinsk. The floating dry dock in Roslyakovo is the biggest in the whole European part of Russia. It has an operating space of 23,000 square meters and can handle volumes of to 80,000 tons. It was originally built in Sweden in 1980 and acquired by the Soviet Union few years later. As the dock sunk, two large cranes tilted. One of them fell over the «Admiral Kuznetsov» creating a 5-meter wide rift in the ship deck. It is Rosneft that owns the floating dry dock after it in 2015 acquired the Shipyard No 82 in Roslyakovo. The oil company intends to turn the yard into a base for its offshore Arctic oil operations. The United Shipbuilding Corporation now says that it intends to sue Rosneft and that the oilmen will have to cover costs related to the repair of the damaged ship.